Burnley are 11 points clear of Cardiff City in 18th after their 2-0 win over the Bluebirds at Turf Moor, with Neil Warnock’s side having 15 to play for. Barring a remarkable sequence of events, the Clarets will be playing their football in the Premier League again come August, but Dyche said: “People will talk about being safe, but we want to make sure factually. Dyche felt his side were good value for the win, after a dominant first half, although the second was a nervy affair until Chris Wood claimed his second goal to kill off the visitors. He said: “I think in the first half we were really good, the game should have been done. “We had a brilliant chance for Woody when he hits the post, a good goal from Woody and Westy has two one v ones, which are hard at this level to find, but it is not out of sight. “And then in the second half, credit to Cardiff: they throw caution to the wind and almost went 2-4-4 and got the ball forward earlier. Cardiff felt aggrieved at having a potential penalty for handball against Ben Mee overruled at 1-0, but Dyche noted: “I wasn't pleased but I will explain why. The linesman has given it from 70 yards away. It is impossible, you can't give a penalty at any level from 70 yards unless he has a clear view, which I can't see how he could have one because of Ben Mee's body shape. “The referee hasn't given it and I think the referee has officiated that very well. “I don't know what he thought because I haven't spoken to him. “He must have been thinking 'I don't think he can give it from there.' I have looked back at it and it hits Ben Mee in the face and it is impossible to be deliberate. “For me, no chance is it a penalty and the right outcome was got to in the end. 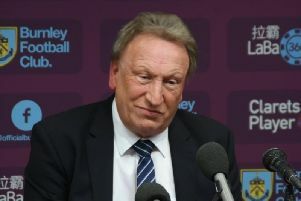 Asked whether he had spoken to Warnock, Dyche admitted: “No I haven’t yet, but I’ve got a lot of respect for him and what he’s done in the game.